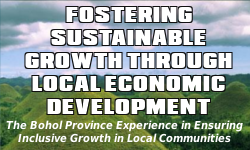 The State of the Province Address is an annual report of the Governor that highlights the accomplishments of the provincial government of the previous year as well as the major plans and programs for the ensuing year, based on the current administration’s development framework. The annual address of the Local Chief Executive is mandated by the Local Government Code and is presented to the Sangguniang Panlalawigan, officials, employees and to the general public. The full text of Gov. Edgardo M. Chatto’s SOPA are available in PDF format and may be downloaded from the links below.